The small Middle Eastern country of Barat is in crisis. The hard-line Army leader, General Shafari (André Morell), wants to see them break their agreements with the West and then play East and West off against each other. When the moderate King disagrees, Shafari has him brutally murdered. No doubt Shafari hopes that the new ruler, Prince Jonetta (Gary Raymond), will be more pliable – but Jonetta (known as Johnny) has a powerful ally – Peter Brady, the Invisible Man …. We’re once again heading off to a fictitious ITC Middle Eastern state, so expect to see British actors browned up and lashings of stock footage. But our stay in Barat is made very bearable by the presence of André Morell . Morell was one of those actors who could have read the phone book and made it worthwhile (although fortunately his character here is slightly more interesting than that). Only just though. Shafari is never developed in any great detail – we do learn that Barat is a poor country and no doubt Shafari hopes that an alliance with the East would be more profitable for them (or more likely, just him) but beyond that he’s a nebulous figure. This doesn’t really matter though, since Morell invests every line of dialogue he’s given with gravitas and meaning and even when Shafari has nothing to say, Morell still captures the eye by glowering memorably in the background. Without him, this one would probably be much more of a struggle. Gary Raymond is perfect as Johnny – he’s boyish, open and honest (making it perfectly plain that he’s keen to put the interests of his people first and would turn out to be an enlightened and progressive leader if he’s given the chance) whilst Nadja Regin as Johnny’s sister, Princess Taima, is on hand to provide a touch of glamour, moral support for her brother and to function as this week’s damsel in distress. When Taima is kidnapped by Shafari, he no doubt hopes it will serve as the lever to force Johnny not to accept the throne – but luckily Brady’s on hand to dish out some invisible fisticuffs and so he calmly rescues her. If Regin seems familiar, then it’s probably due to her several small, but eye-catching, appearances in the early James Bond films. The most memorable one came in the pre-credits sequence for Goldfinger where she acted as the decoy for Alf Joint’s swarthy assassin. “Shocking”. It’s something of a treat to see two Professor Quatermasses sharing the screen. 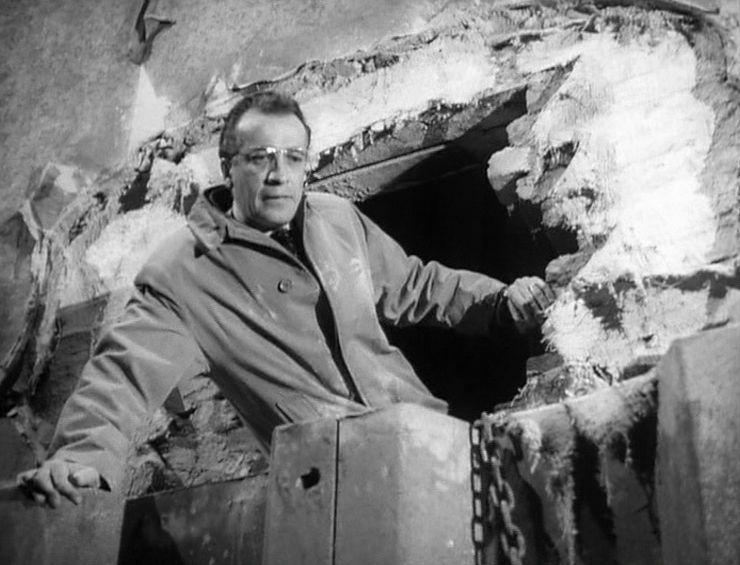 Not only Morell (who played the Professor in the television version of Quatermass and the Pit) but also Andrew Keir (who would later play the Prof in the Hammer film adaptation of Pit). Keir’s role of Hassan, a supporter of Johnny, isn’t terribly interesting but it’s nice to see him nonetheless. As so often, we’re left with a rather pat ending. After Shafari is captured and led away we’re led to believe that the crisis is now over. But this supposes he was the only bad apple and that the rest of the army will now be loyal to Johnny. Real-life would suggest he’s got troubles ahead, but Man in Power elects to close on an optimistic note. Although some of the stock footage really stands out (it’s so scratchy that it doesn’t convince for a minute) the presence of André Morell adds more than a touch of class to the episode. Another very enjoyable twenty five minutes. The unfortunate Private West (John Walker) has seen something strange inside the capsule. His collapse agitates Breen considerably – it’s another inexplicable happening and therefore something that the Colonel hasn’t been trained to deal with. But it is interesting to see that later in the episode he does calm down and his relationship with Quatermass, whilst still a little spiky, is more settled. Observing the activity around the capsule, Corporal Gibson (Harold Goodwin) wonders if Quatermass knows what he’s doing and decides that “he doesn’t. None of ’em do this time.” This is quite true as Quatermass is as much in the dark as everybody else. By the time we reach the end of the story we’ll be able to consider just what the cost of Quatermass’ scientific curiosity was. He wants to see inside the sealed chamber (as does Breen) and it’s this desire which causes all the problems from hereon in. But, of course, had he not then the story would have been a good deal shorter! 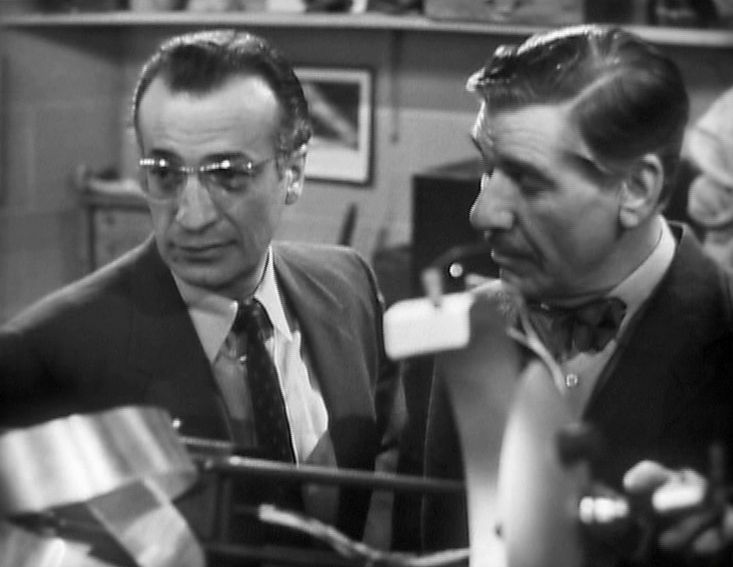 Quatermass and Breen agree that a borazon drill might have a chance of making an impression on the door. It would mean hiring a civilian contractor, but it’s judged to be worth the risk. Sladden (Richard Shaw) turns up and prepares to set to work. He’s a cheerful chap, although subsequent events wipe the smile off his face somewhat, especially in the next episode. Sladden’s initial drilling certainly generates a reaction – creating an unearthly sound which affects everybody – especially Sladden, Quatermass and Breen. Quatermass grabs Roney and leaves the pit area in a hurry, urging Potter to tell Breen not to continue with the drilling until he returns. Whilst this is going on, the press (in the shape of James Fullalove) begin to take more of an interest. 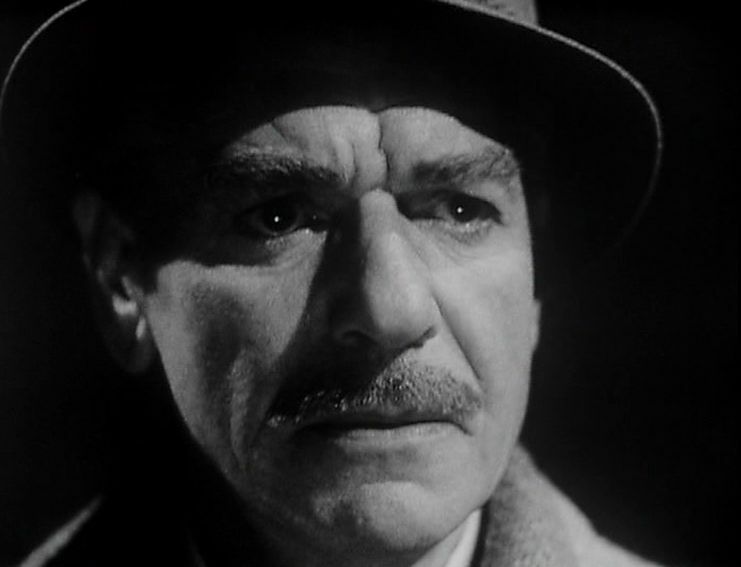 The character of Fullalove had featured in The Quatermass Experiment and it had been hoped that Paul Whitson-Jones would reprise the role, but as he was unavailable Brian Worth took over. Fullalove attaches himself to Quatermass and Roney and the three of them set off to do some research. In the previous episode, we saw how Hobbs Lane had featured in the newspapers (back in 1927) when the story of the ghost surfaced. Imps and Demons delves even further back into the past as it becomes clear that mysterious sightings and disturbances have been recorded for centuries, dating back to medieval times. Returning to the pit, Quatermass finds that a hole has been made in the capsule, but not by Sladden – it just simply appeared. Breen is still attempting to find a logical explanation for this strange occurrence. “I suppose the vibrations of the drill must have affected all this material in some way.” But even he can’t explain what he sees within the chamber. He allows Quatermass to look and the Professor is equally surprised and shocked – there’s a telling moment between the two of them (for once, we see no bluster from Breen – he simply has to accept the evidence of his own eyes). When the door is finally opened, the occupants of the capsule are exposed for the first time in five million years. Quatermass reassures Breen. “It’s all right. They’re dead. They’ve been dead for a long time.” It’s another striking cliff-hanger which only adds another layer of mystery to the story. If the strange inhabitants are dead, where do the centuries worth of disturbances emanate from? Quatermass and the Pit is as much a ghost story as it is a science fiction one. This is a theme that Kneale would re-use in the years to come (The Stone Tape) and it’s easy to see why – the clash between science and superstition is a very potent one. Doctor Who would also draw heavily from this Kneale template over the following decades (The Daemons is a prime example and Image of the Fendahl is probably the Doctor Who story most indebted to QATP). Whilst the work to uncover the mysterious object continues, Quatermass is intrigued by the derelict house at the nearby Hobbs Lane. This disrepair wasn’t caused by bomb damage (as it’s clear that only a handful of incendiary devices fell in this area during WW2. Which also makes Breen’s claim that the object is a previously unknown German weapon rather unlikely). The discovery that the object is emitting radioactivity (although at a very low level) is enough to ensure that operations are suspended whilst tests are carried out to verify whether it’s safe to continue. 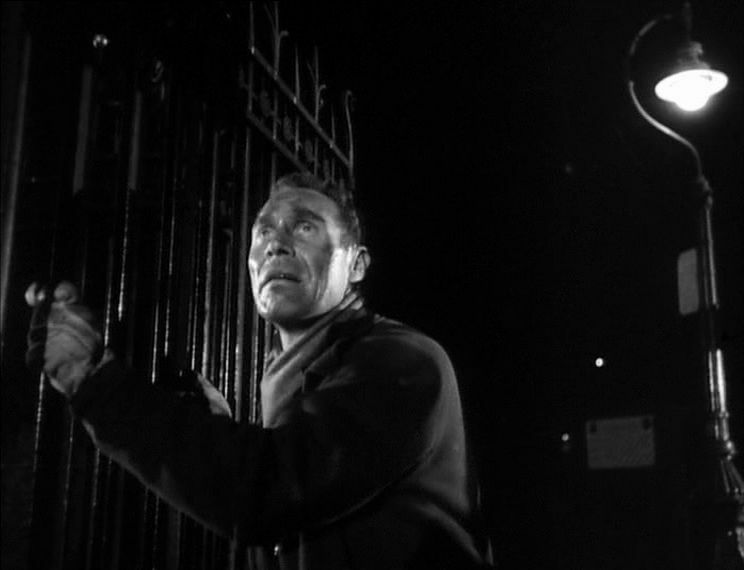 At something of a loose end, Quatermass heads over to the abandoned house to have a look around. He’s joined by P.C. Ellis (Victor Platt) who knows the history of the place and confirms that it’s been empty since 1927 due to a ghost scare. Although Ellis was only a child back then, he still remembers the stories and whilst he tells Quatermass that it’s clearly all nonsense, he displays a palpable sense of unease as he moves through the house with Quatermass. Victor Platt is terribly good in this scene, it’s mostly just exposition (laying the groundwork for the tale of the haunted house which Mrs Chilcott will explain in more depth later) but Platt is able to give Ellis a real sense of character. Good performances from the minor players are one of the main strengths of this serial. Two residents, Mr and Mrs Chilcott (Howell Davies and Hilda Barry) have been evacuated nearby, so Quatermass pops in to speak to them. Barry had previously appeared in Quatermass II (as Mrs Large) and she gives another nice cameo performance here. It’s obvious that she’s the dominant partner in the marriage, particularly since Mr Chilcott seems to be rather poorly. “I couldn’t find his long woolies, you know, his clean ones. He may have to wear two pair at once. It’s cold.” As the majority of the story is set amongst the military, her appearance does lighten the mood a little. The Chilcotts are staying with Miss Groome (Madge Brindley). When Quatermass enters, Miss Groome is telling Mrs Chilcott’s fortune with tea leaves. This tells us that Miss Groome is a believer in the supernatural and is therefore somebody who holds diametrically opposed views from the rational Quatermass. So his interest in the haunted house does surprise her. “I thought all you scientists were sceptics” she says. “We’re open-minded, most of us, or we try to be” he replies. Mrs Chilcott’s story – mysterious noises, objects moving by themselves, a ghostly figure – is fairly typical, but what’s the explanation? Miss Groome would no doubt be adamant they were manifestations from the other side, but the obvious inference being drawn is that it may have something to do with the mysterious object – which has apparently lain undisturbed for five million years. The discovery of another ape skull – this one actually in the object – gives Colonel Breen even more pause for thought. Anthony Bushell is very solid as the blinkered solider. He likes things to be logical and rational and as the evidence begins to pile up to the contrary, he begins to lose his grip. It’s only expressed in a subtle way during this episode, but it becomes more pronounced as the story progresses. His reluctance to believe the evidence in front of him is highlighted by a report that confirms the radiation dates from five million years ago. Since he finds this impossible to believe, he’s quite happy to dismiss it – anything that’s outside of his understanding he ignores. If Quatermass and the Pit is something of a puzzle, then Breen is the sort of man that will desperately try and make the pieces fit – even if it’s clear they don’t. Quatermass later tells Roney exactly what he feels about his new colleague. “I told you my Rocket Group’s been taken over. Well, he’s the official receiver. He’s a career militarist of the worst type. Cold, efficient, just biding his time. That’s my colleague.” Breen elects to use excavators to quickly unearth the object and its eventual reveal is an impressive moment. It’s a wonderful piece of design work from Clifford Hatts – it looks substantial and solid. Whilst some people may feel that this episode hasn’t advanced the plot very far, I’d disagree. It’s been more about character and atmosphere – and both have been delivered in spades. The cliff-hanger is also very striking and provides a strong hook into the next episode. One of the soldiers, upon entering the object, reacts in terror at the sight of a mysterious figure who walked through the wall. Instantly this recalls to us the stories of the haunted house in Hobbs Lane and the connection helps to tie the various story threads a little tighter together. For many people, including myself, Quatermass and the Pit is the pick of the Quatermass serials. Partly this may be due to familiarity (an edited compilation was released on VHS in 1988) but it’s undeniably a quality production. It’s certainly the best-looking of the original trilogy, thanks to advances in the late 1950’s with the telerecording process as well as the existence of the original film sequences. Quatermass II was telerecorded with a suppressed-field recorder, whilst Quatermass and the Pit used a stored-field film recorder. The upshot is that the picture quality of this third serial is much more detailed and smoother (plus the original video look was restored for the DVD release). The film sequences, as per usual for the time, were shot on 35mm film and the majority of them have scrubbed up very well. Comparing the pristine film inserts here to the blurry ones from Quatermass II is pretty much a night and day scenario. So it looks very good, but what about the story? It’s a very different beast from Quatermass II. QII hopped from location to location and had a fairly large cast. 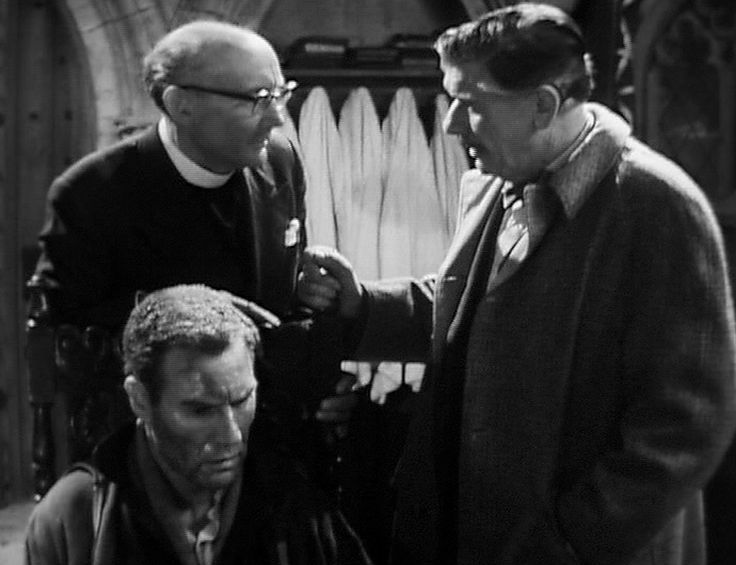 Whilst various characters come and go in QATP, the action centres on just three individuals – Professor Quatermass, Dr Matthew Roney and Colonel Breen. After the wooden performance of John Robinson, it’s clear within a few minutes that we’re in very safe hands with André Morell. Morell’s Quatermass has many traits that Robinson’s take on the character sorely lacked – a wry sense of humour and personal charm, for example – whilst he still exhibits the same steely determination. 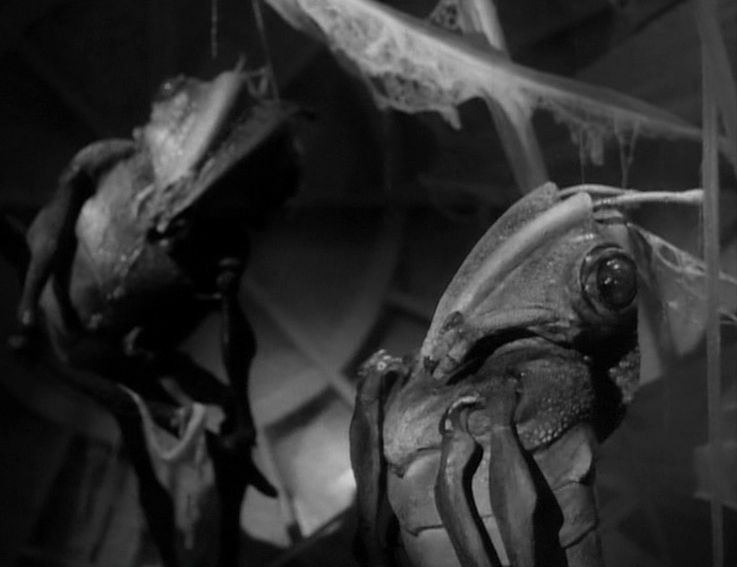 As we’ll see in this episode, this is an older, more embittered Quatermass. The rocket group that he founded is still active, and establishing bases on the moon is still the intention, but the military now have the upper hand and Quatermass faces being reduced to a mere bystander. Dr Matthew Roney (Cec Linder) is, like Quatermass, an expert and enthusiast in his field. The opening scene shows us the discovery of a strangely-shaped skull, unearthed during the redevelopment of a site in Knightsbridge. There’s a nice piece of visual shorthand used after this – as the camera tracks across a series of newspapers, each displaying related headlines (“Apemen at Knightsbridge”, “Further discoveries at Knightsbridge”, “Knightsbridge Apemen – More Finds” and “Three More Bodies Says Scientist”) which significantly advances the plot in a matter of seconds. Colonel Breen (Anthony Bushell) has just been seconded to Quatermass’ rocket group as deputy controller. Breen is the personification of everything that Quatermass despises, so it’s pretty clear that their partnership will be an uneasy one. In this episode, Breen appears to be a straightforward, capable officer. As the serial develops, we’ll see how he reacts when faced with events that are outside his strict frame of reference …. Needless to say, this speech (delivered to mostly military types) is treated with stony indifference. So it’s maybe something of a relief when Roney turns up with a problem. The excavation has been halted – due to the discovery of what looks like an unexploded bomb. Roney isn’t happy with the officer in charge, Captain Potter (John Stratton), and wonders if Quatermass can do anything to help. Quatermass rather neatly manages to persuade Breen to take a look, so the three of them head out to the site. Stratton would be a familiar television face for decades (much later he would turn in a ripe performance as Shockeye in the Doctor Who story The Two Doctors). He’s much straighter here (and barely recognisable) as the young officer. There’s also some familiar faces in his squad, such as Harold Goodwin as Corporal Gibson and Hammer Films stalwart Michael Ripper as the Sergeant. By the time we reach the end of the episode, many of the blocks of the story are in place, but there’s plenty of facts that are still unclear. What’s interesting is how the pieces of the puzzle are slowly assembled – basically Quatermass and the Pit is a detective story and we’ll see Quatermass and the others uncovering information in the later episodes by various means (via books, talking to people, experiments, etc). This is far removed from the thriller-like Quatermass II which operated in a much more straightforward way. What appeared at first to be an unexploded bomb now looks increasingly odd. It’s far too large, for one thing. And the other important fact that Quatermass alone seems to have grasped is that it was below where the skull was found. And if the skull had lain undetected for five million years, how long has the “bomb” been there?